The Institute On Religious Life sponsors an annual National Meeting for Religious Life. This year's conference will be April 29-May 1, 2011 at Mundelein Seminary in Mundelein, IL. We have been members of the Institute on Religious Life for many years. Although we don't attend either the National or Religious Meetings we support their work by our prayers. We benefit from belonging to the Institute by being listed on their website and a special website called CloisteredLife.com. Belonging to the Institute also gives us the opportunity to make cloistered life and Dominican life better known. This year our monastery has been honored to take part in the National Meeting. The theme of the of the Meeting is "Go Make Disciples: Utilizing the New Media for the New Evangelization". 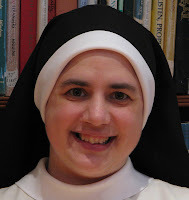 Our Sr. Mary Catharine has been asked to give a talk via SKYPE on how our monastery has made use of the Internet to share what our Dominican monastic life is all about and the way our blog and website have been an instrument that God has used to attract young women to our monastery. We encourage you to get more information about the Institute On Religious Life and consider going to the National Meeting which is an exciting weekend for priests, religious and lay people who believe in the future of religious life and are excited by the work of the Holy Spirit who is drawing many young people to follow Christ in a life of total consecration to Him! 2011 March For Life: 1 Hour and 30 Minutes Time Lapse Video!